Basketball has the “Fab Five”, football has the “Fearsome Foursome,” and Miami Diving has “The Three Amigos”—possibly the greatest recruiting class in collegiate diving history. In 1995, UMSHoF member Coach Randy Ableman assembled 3 remarkable freshman divers, Chris Mantilla and UMSHoF members Bryan Gillooly and Tyce Routson. The trio would go on to dominate the collegiate diving world for the next 4 years, winning 7 national titles and 30 All-American honors. The Three Amigos are reunited again as Chris Mantilla is inducted into the UM Sports Hall of Fame. Chris came to Miami from Spanish River High School in Boca Raton, where he was a two-time Junior Olympic champion, the 1994 Florida state champion and having placed first at the 1994 World Championship Trials and winning the 1994 Cuban Cup. As a freshman, he would garner All American honors in the 1-meter and 10-meter platform categories. In 1996, Chris would claim the NCAA title in the 3-meter event, and would finish second in the 1-meter and third in the 10-meter platform as the Hurricanes trio swept the top three spots in the three events. As a junior in 1997, he would be named an All-American for the second consecutive year in all three events. As a senior, he was named an All-American for the 9th time, claiming the honors in the 10-meter platform category. He also was the 1996 Big East champion in the 1-meter and 3-meter events. 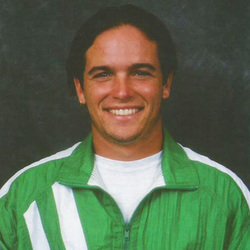 Mantilla also showcased his talents on the World stage, as a 10-year member of the United States National team, a 4-time U.S. National Champion, a finalist for the World Championships and Goodwill Games and he was a 1999 World Cup Silver Medalist. Chris graduated from UM with a Bachelor of Business Administration with majors in both International Finance & Marketing and Computer Information Systems. He and his wife, Sandra, also a double UM graduate, have a son, Owen.